What is it: a picture book, textbook, coffee table book, reference book or living history museum? Using a bit of each of these elements, Broom and Scott have put together a book that explains evolution from the opening galleries of insects and invertebrates to the closing exhibits of large mammals. Beginning with a tree of life, an illustration covering two pages, they show how different groups of animals are related and how the animals have evolved from one another. 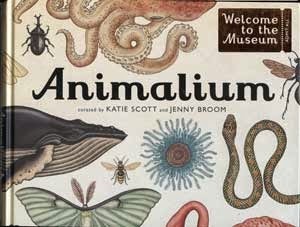 Each chapter represents a different museum gallery, each focusing on one class of animal. Members of each class are described on two-page spreads, text on the left with the plate of illustrations on the right. A key to the plate, giving additional information about the animal depicted, is provided under the text and is linked by number to the illustration. The illustrations are pen and ink, with color added digitally, a beautiful blend of traditional and modern illustrative techniques. This choice of media and the arrangement of images on the plate make reference to established approaches to scientific illustration and the color reinforces the impression of form and liveliness on the page. Broom ends her book with an index, a bio of each “curator” and a list of reference materials labeled “To Learn More.” From Candlewick Press/Big Picture Press (2012), Ages 8 to 12, ISBN: 978-0-7636-7508-0. Reviewed by Hazel Buys.